This is displayed near the top of the main window, and sometimes on subsidiary windows, when applicable. These can each be shown or hidden from the toolbar context menu (see image below). They are also moveable by clicking and dragging one of the vertical bars, in the image at the extreme left, and between 'Connect' and 'Reply'. Click a HotSpot on the image below for further information. Some buttons may be disabled where their function is not applicable to the current situation. The size of the buttons can be changed from the Customise menu, as can many other aspects. 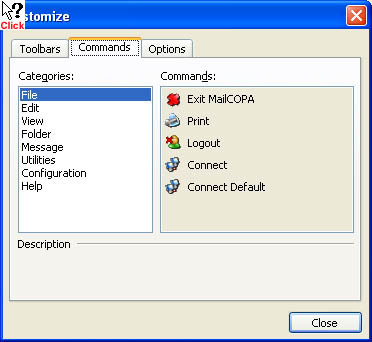 NOTE that the toolbars are stored locally and will not be available if the same MailCOPA User logs in from another computer, nor if a different Windows User is used on the local machine (they are stored in HKEY_CURRENT_USER). A high degree of customisation can be achieved to suit your own way of working. 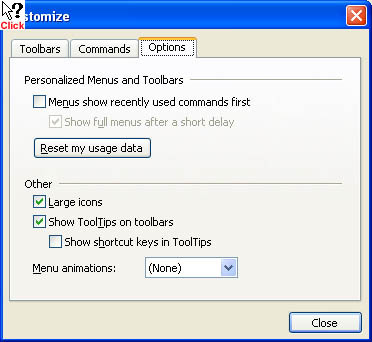 It is possible to add your own toolbars, and add various buttons to them. Once created, the toolbar will be free-floating, but can be dragged anywhere you wish, including being added to the mail toolbar by dragging and dropping onto it. 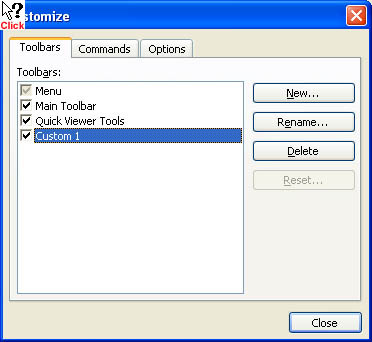 The custom toolbar's context menu allows the temporary addition or removal of buttons. •Add commands from any of the menus onto the toolbar.